No not dogs! That may be man’s best friend, but diamonds and all that glittery stuff is what I’m talking about. Speaking of jewelry, I recently a cocktail party at the Aaron Faber Gallery off Fifth Avenue. We’ve all heard of Cartier, Harry Winston, Bulgari, et al. but I bet you haven’t stopped by this jewelry boutique off the beaten path. Even if you’ve spent your last dime on Christmas presents it will give your spirits a lift just to gaze (longingly) at the gorgeous baubles. Who was that masked hippopotamus? Cocktail rings are hot now and Garnazelle has a knockout version. Called “Boule D’Amour” (ring of love for you peasants who don/t speak French), the ring features an eye popping white cabachon cacholong stone set in 18K pink gold. 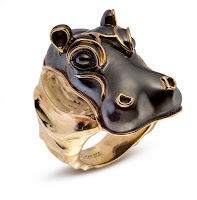 More tongue-in-chic is the diamond studded yellow gold ring in the shape of a little frog. www.garnazelle.com I also took note of another dazzling cocktail ring at La Joaillerie Recreative. It featured a 27K faceted green quartz stone surrounded by 138 diamonds and set in a cage of 18K yellow gold. Not too shabby! 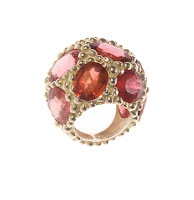 Creative director Christine Escher collection features other pieces in precious wood, gold, diamonds and semi=precious stones such as her “Rock and Roll” ring in rubellite, garnet, carnelian and citrine in the shape of a flower set in yellow gold. www.christine-escher.com. I challenge you to pick the ideal drink for each of these rings! The companies I’ve just listed were part of The Jewels of France Exhibition and Trunk Show which is an annual week long gathering of some of France’s most acclaimed jewelry houses and their designers. This was the second year that they were aligned with the Aaron Faber Gallery at 666 Fifth Avenue, NYC. That’s all for now folks. Happy Holidays. Coming up for the new year will be my first look at spring 2010 accessories. Yes I know that the fall fashion shows will be on the horizon but for you fashionistas out there it’s the spring stuff that will be hitting the stores in February that you need to know about. Next fall’s a long way off.